after they’ve been committed to git. If a file has been changed, but these changes have not yet been staged with git add, then the changes can be undone using git checkout. The instructions for using git checkout to undo changes are described in the output of git status. Let’s look at an example. First, let’s modify the readme file by adding some text to it at the command line. Now, the contents of your README.md file has been reverted to the last saved or committed version and you’ve discarded the most recent changes. Git checkout can undo unstaged changes by pulling the previous commit's version of a file from repository's history. Source: Maxwell Joseph, adapted from Pro Git by Chacon and Straub (2014). Let’s see how git checkout works. Make a few text changes to your README.md file. You can make these changes in shell using the example below OR your favorite text editor. Save your changes (if you’re in a text editor). Remember that once you add a set of changes to git using git add, the file is then staged. 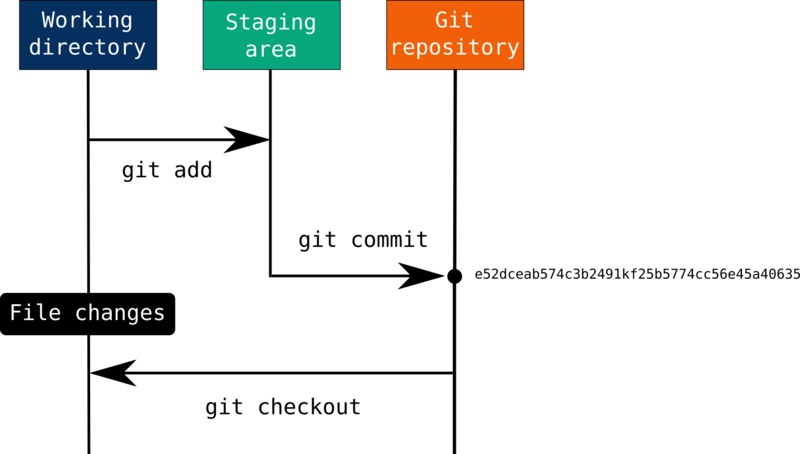 If a file has been changed and then staged via git add, then you use git reset to pull the most recently committed version of the file and undo the changes that you’ve made. When you use git reset, your changes still exist in the file, but the file has been unstaged (the changes are not added to git, yet). Now that you have changes that are not staged, you can use git checkout to undo those modifications. Git reset is essentially the opposite of the command git add. It undoes the add. Practice using git reset and git checkout. Use git add to stage your changes to the README.md file. Undo the commit that you made using git reset. Then revert back to the previously committed version using git reset. If you have modified, added and committed changes to a file, and want to undo those changes, then you can again use git reset HEAD~ to undo your commit. Similar to the previous example, when you use git reset the modifications will be unstaged. Notice that now your file is no longer being tracked! If you inspect the output of git log, you will notice that your previous commit is no longer part of the repository’s history. The .gitignore file lives in the home directory of your repo. Any files listed in this file will be ignored by git. You can also tell git to ignore entire directories. Data tip: Learn more about using .gitignore files to ignore files and directories in your git repo on the Software Carpentry git lessons website.